With the onset of customer first ideology, businesses have started to channelize their energy towards a wow customer experience that becomes a value differentiator for them. Customers seek the experience that adds value to their lives and solves their problem quickly. Customers will remember your brand if they are delivered the services that are promised. “Customer service is not a department, it’s a philosophy”, says Shep Hyken, Chief Amazement Officer at Shepard Presentations. He introduced the factors that when combined together results into a seamless customer experience that customers demand. But, What exactly is Customer Experience? Customer Experience is not built overnight, it is practiced and strategized over the years. When a customer calls in for a refund, understanding the grievances would make it a better experience. A wow experience strategy would be to improve customers’ lives and earning customer’s loyalty. Ameyo recently partnered with Freshworks in the Customer First Summit and the team has gained insights into customer experience with the industry leaders who shared the knowledge and years of wisdom into the CX game. From the words of Shep Hyken, Jeanne Bliss, and Girish Mathrubootham, here are the key takeaways that you should not miss. In a talk with Shep Hyken, we were reminded of how we can be present at every touch point for our customers and how to go up and running about CX game. Show Appreciation: Tell your customers that you are happy with their choice of product and let them know that they are valued. Get Feedback: How would you know what works for your business the best? In Shep’s experience, it is important to get insights into customer’s choices. Learn customer’s problems through this feedback. Act on Feedback: This couldn’t be truer. Analyze the pattern and know what works for your customers. Address customer’s pain points and get a hold of their problems, resolving them in one go will get you a delighted customer and a promoter for life. “How we are treated as customers make all the difference”, Jeanne Bliss, Founder, and CEO at Customer Bliss, rightly stated at the event. Treating customers with dignity and respect will help you earn advocates, you just need to shift your attitude towards customers’ life. Understanding your customer: What your customers want to achieve through your product and what are their expectations when they choose the services you provide? Making it a success for your customers, you need to take the high road and be available at all points in your customer’s buying journey. Make it easy for the customers: Be present. Customers should not struggle to reach your customer service reps. A tricky multi-level IVR may frustrate them and that’s exactly what you wouldn’t want for them. “Put others before you”, didn’t your mother told you that? Putting the needs of customers first is an easy game that will drive their loyalty. Let customers feel that you know them: How often do your customers have to repeat their information? If it’s more than one time, your CX strategy is gone wrong and your customer satisfaction score is also compromised. Ask yourself, “Do you know your customer’s vulnerability moment?” Let your customers feel that you’ve known them since they became your prospect and you understand their problems and expectations. How do you monitor your brand on social media? Girish Mathrubootham, Founder & CEO at Freshworks Inc, in a conversation with David Thompson, Chief Marketing Officer at Freshworks explained how Ticket Monitoring can drive insights into customer’s journey. Customer support is everyone’s job: Why customer support should not be limited to one department? It should be a shared vision of the entire organization so that whenever a customer has stuck anywhere, each employee should know how to walk the customer through a high satisfaction rate. Ticket Monitoring: Let your agents be on toes to serve the customers in the best possible ways. And how? If a manager jumps in ticket dashboard and replies to some of the tickets, agents would know that they are keenly monitored and there’s no space for any mistakes. Support can really be strategic: Girish explains that it’s no simple theory applied across the organization. Support can really be strategic and it could be planned thoughtfully while observing the patterns of customer’s pain points. Whenever a customer is unhappy, an email could be shot to the manager instantly and sentiment analysis explains the criticality of the ticket. 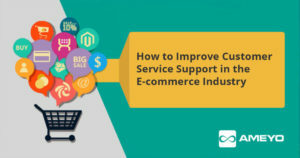 “Every customer support scenario is actually an opportunity,” says Girish Mathrubootham. It is an opportunity to understand the customer’s problem and give an instant reply. This strategy drives incomparable results when agents empathize with customers. This practice not only solves customers’ problem but also give you an advocate of your brand. “Customer is not always right, but they are always customers”, Shep Hyken blows the bubble of customers being always right. While closing his discussion, he says that customers only demand to be treated with respect and dignity and their buying cycle becomes smooth when they are valued. Previous postWhy Do We Need A Strong Call Center Software In FinTech Industry?